This Wine Country vacation and travel guide will discuss two very special counties in the Golden State – Napa and Sonoma – home of America’s most established wine region. 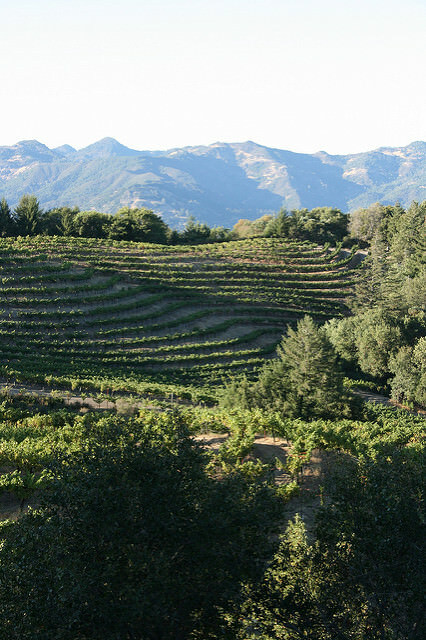 California’s Napa-Sonoma Wine Country is the state’s second most popular tourist destination (the first is Disneyland), and it offers superb culinary and spa offerings in addition to simply stunning natural environs. In this section, you can learn about the cities of Napa and Sonoma, of course, but other wonderful places to visit, as well, for example: (1) Yountville, St. Helena and Calistoga (in the Napa Valley); (2) Glen Ellen, Healdsburg, Santa Rosa and Petaluma (in and near the Sonoma Valley); and, (3) Bodega Bay, Fort Ross, Sea Ranch and Gualala (found along and near the Pacific Ocean coastline). If you’re unfamiliar with the area, you can follow this link to a California Wine Country Tourist Map and there are also links within that article to other handy winery map resources. The scenery you will find depends upon the season of your visit, but the vineyards are lovely all year-round – teeming with yellow mustard flowers in the spring or vines laden ripe, awaiting harvest in the fall – so be sure to bring a camera. Many Wine Country visitors, in fact, prefer to come during the off-season. The area slows down a bit after the summer and harvest have passed, and for many people the winter and spring climates are more temperate, as well. make your dinner reservations months in advance, especially if the trendiest restaurants are on your “can’t miss” list. When it comes to Wine Country dining, however, don’t forget about the picnic option because this may very well be the best place on Earth for a picnic! Napa Valley is warmer in the summer than its western neighbor, and this is why it is better known for its Cabernet Sauvignon while Pinot Noir and Chardonnay are Sonoma’s most popular varietals. Each person has different tastes and preferences, of course. If you’re new to learning about wines,the variety that the Napa-Sonoma Wine Country offers makes it a perfect destination for a wine introduction vacation. Just remember that wine is really nothing more than a beverage – certainly nothing to feel intimidated about – and the most important thing is to have a good time during your visit.